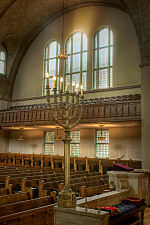 Our congregation, Beth Am Synagogue, was founded on Shabbat Chanukah in 1974. Prior to 1974, our building served its original owners, Chizuk Amuno Congregation, who built it in 1922 but moved to its present location on Stevenson Road in 1962 at a time when many congregations were following their members from the city out to the suburbs. A founding principle of Beth Am is to remain in Baltimore City and to be a vital and stabilizing force in its Reservoir Hill neighborhood. From 1962 through 1974, Hazzan Abba Weisgal continued to lead regular services in the synagogue building and was joined on High Holydays by Dr. Louis Kaplan, the retired president of Baltimore Hebrew University. When Chizuk Amuno put the building up for sale in 1974, members who had been worshipping at the old building hastily formed a congregation and purchased it. Dr. Kaplan’s wife, Etta, suggested the name “Beth Am,” or “House of the People.” Dr. Kaplan continued to serve as rebbe until 1981, when Beth Am hired its first full-time rabbi. …We are respectful of tradition, but are not bound by it. The past is not to be mere prologue, but neither is it to control our decisions. We want to feel free to introduce innovations that are in harmony with our view of the quality of women and men, and our understanding of Jewish law as a dynamic process which combines continuity with change. Jewish study and teaching are more important to us than recitation of prayers; Jewish ethics, as they have evolved and have been refined by centuries of Jewish experience, are our on-going concern.